​Join us on Friday, Dec 9th, for the annual Howard High Music Boosters Barnes & Noble Bookfair at Long Gate Shopping Center. Get some holiday shopping done and support the Instrumental Music programs. 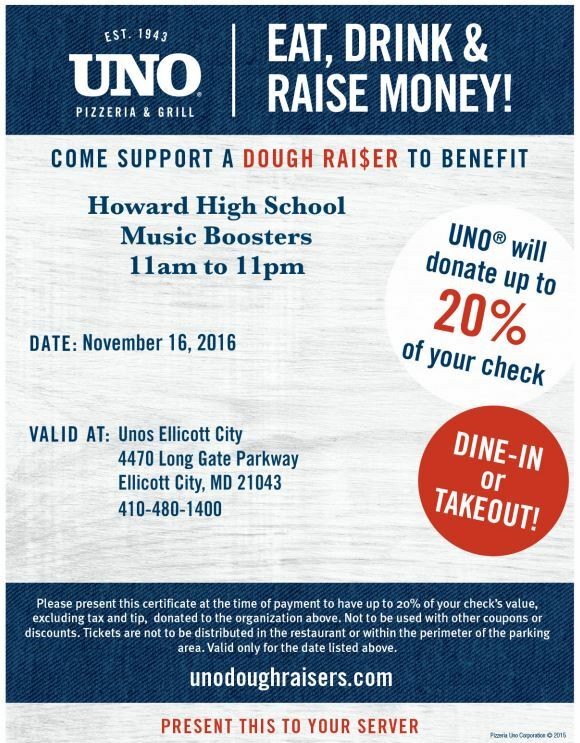 Every purchase benefits the musicians at Howard High School. Shop between 4:00 and 9:00 PM and enjoy performances by HoHS musicians throughout the evening Students will be providing complimentary gift wrapping as well! Click here for all the details on the Bookfair and here for the flyer. We look forward to seeing you there! Come out and enjoy some great food and help support the HHS Music Programs. We are hosting a Restaurant Night at Uno's in Ellicott City on Wednesday, November 16th. Present the flyer at the time of your order and we will benefit from up to 20% of the purchases that evening! It is good from 11am to 11pm, for dine-in or takeout. Thanks and we look forward to seeing you there!